Today, we’d like to talk about stuff. And that’s not just a vague conversation starter. We really want to talk about: STUFF. Here in America, we have a lot of it- clothes, gadgets, tools, and toys. There are lots of facts out there about the amount of stuff that Americans consume (and throw away!) each year. Check out the EPA’s website for more details and facts. 1. Where does the stuff come from BEFORE we buy it? What are the REAL COSTS of our stuff? 2. Couldn’t there be a step between our stuff breaking and the garbage can? 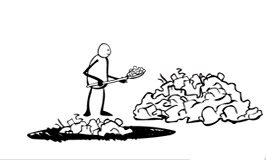 For some thoughts on the first question, check out this great video by Annie Leonard: The Story of Stuff gives a look at the cycle our stuff goes through and the real consequences of our consumerism. Next, take a look at an innovative Brooklyn group called the “Fixer’s Collective.” You can check out a video made by GRIST that details this group’s exciting, novel idea: What if we made time to fix our broken things, instead of replacing them. The Fixer’s Collective has set aside time and space to make this possible. The result might be more than a way to reduce garbage. Check it out.